I don’t necessarily mind doing LFR. I’m a healer, so I get quick queues and I’m not likely to be vote-kicked for lulz. But LFR isn’t always fun. Some encounters are too challenging for a disorganized group. Sometimes you wind up getting grouped with jerks that you don’t even want to spend virtual space with. Sometimes you wipe dozens of times surrounded by people you hate and you really start to question your life choices. Which is a roundabout way of saying that I don’t LFR when I don’t have a reason to, and at present I outgear it. That would usually mean I can ignore it, but I went in to investigate for you. So I hope you appreciate my sacrifice. Q4TQ: How’s the final wing of LFR? Some of the Uldir fights are complicated, and haven’t been particularly un-complicated for LFR… but I’ve still been pleasantly surprised at LFR success rates despite tremendously sloppy execution. The Mythrax kill I just did involved a half a dozen people dying by jumping into the pit on their own and pulling the boss. (Maybe we need a buddy system where we all hold hands.) Then some of the DPS managed to get up to 50 Annihilation stacks, at which point I have no idea how they were even alive. Still, brute force prevailed and we one-shot it. G’huun was more problematic, and we wiped four times before getting him down — but that’s still not the worst LFR experience I’ve had. There are just a lot of mechanics to the fight, and without the group knowing them, we floundered. A couple of players seemed to understand what to do with the Power Matrix orbs, but there wasn’t any organization to it and they were getting run very slowly. A lot of players weren’t running Explosive Corruption out of the group so it wound up in the middle of the raid. The Cyclopean Terrors weren’t getting interrupted or focused down and we had 20+ up on most wipes. Some of this is easy raid 101, i.e. deal with adds, run bad stuff out of the group. But some of it is down to the fight being complicated. You have to have people who know how to run the orbs, people who can handle a long fight with lots of stages and abilities. Considering the complexity of the fight, I don’t think four wipes to down him is all that bad. (It’s not nearly as bad as Kil’jaeden, who I don’t think I ever killed in LFR.) 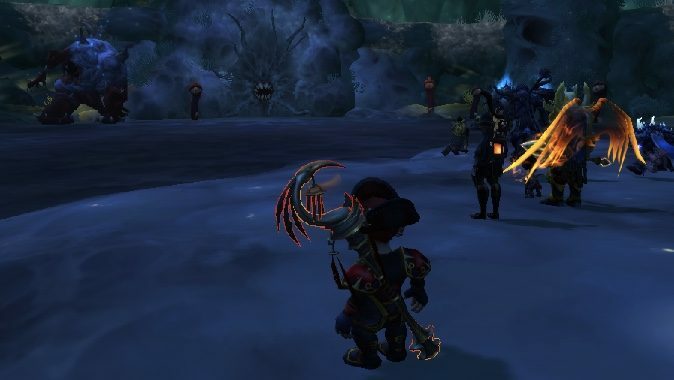 If you’re planning on heading into LFR, read up on the fights first — particularly how to deal with orbs on G’huun. Running orbs will be the difference between a long series of wipes and a quick success, so learn how in case you wind up in a group that doesn’t know what to do here. Sooooooo, items in your bags count toward the overall ilevel calculation for what ilevel azerite gear you will get from the emissary cache? Guess that’s why I got 340 gear even though my overall equipped ilevel was higher than that (which is the only thing I look at). Lesson learned the hard way folks! Make sure to clear out all the gear in your bags that you’ve been meaning to run thru the scrapper before you turn in your emissary. I had a bunch of under 300 gear in my bags that must’ve been weighing me down. Blizzard has done an absolutely lousy job of explaining this. First they said it was based on the highest item level of gear you have had equipped in each slot (including gear you don’t have anymore), then they said it’s based on the average ilevel of the all gear you have. I’m guessing that it’s a mix of the two and is the average of the highest ilevel gear you have. But I still think it’s broken… at least if it’s supposed to give us gear upgrades. I’m at ilevel 363, and the Azerite caches I’ve seen since this hotfix went live have been 355. Which, depending on the traits they had, could be upgrades, but won’t be item level upgrades. It would be a way to get better traits rather than to get better gear. Which is… not the most exciting thing in the world, but at least it’s something. Blizzard acknowledges that the scaling needs tweaking, and there’s a hotfix coming that should make scaling a little more generous. So I think we’re just going to have to re-evaluate the system when the hotfix goes live. Until then, my Azerite slots will remain my lowest ilevel pieces. Whee. Q4tQ: Do you use your Artifacts as Transmog? Absolutely, though I suppose I could be a special case. Firstly, my Mistweaver is currently using a 1-hand/off-hand combo, and, well, every off-hand in the game looks dumb. Literally every one. So it’s a total no-brainer that I’m using the Shei’lun appearance. I have a few different looks and a lot of different colors for it, so it’s easy enough to coordinate with different transmogs. Then there’s my Holydin, and it is completely ridiculous to think that I am not going to spend the rest of my WoW career with a giant hammer equipped. How would you know I was a healer otherwise? But I suppose your mileage may vary. Not every artifact was a giant hammer, so I can understand if maybe you don’t want to use it for transmog forever. How’s monk healing compared to other healers in your groups? Have you been having fun or do you wish you were priest? Second: I think Mistweavers are in a good place. They have a versatile healing toolkit that lets them focus on tank healing, raid healing, or damage to healing, which means they can be slotted in for any healing need. They aren’t topping the rankings on Warcraft Logs, and they’re still less common than other healing classes But if you were paying attention to the world first Uldir race, Method was running multiple Mistweavers, which I think says as much as you need to know about their viability. I don’t necessarily feel like I’m doing that great all the time. My regular group is myself, two priests, and a paladin and… okay, despite what I said about priests earlier, it’s usually a priest on the top of the healing list. But boss to boss I can be anywhere from top of the healing numbers to bottom of the healing numbers. Usually I’m somewhere in the middle, and I’m good with that. Right now, Mistweaving requires some juggling, and I don’t always feel like I handle it with enough precision to maximize my healing. I’ve gone from not using Weakauras at all to having a dozen of them to monitor cooldowns and tell me “Liz, you idiot, you can cast Renewing Mist again.” Okay, it doesn’t literally say that because I’m not going to read all of that in the middle of a fight, but that’s essentially its purpose. Have you healed in Uldir yet? What’s it like, from your perspective? What fight has been the hardest for you? I’ve been running normal and heroic, and honestly I think the hardest thing in the raid is the trash. Uldir has a lot of trash and some of it is vicious, with the potential to tear through a raid with cleaves and debuffs. Of course the trash isn’t literally more difficult than the bosses, but it hits hard during that lull between bosses when you think you don’t have to pay as much attention. While I usually hold my healing cooldowns for bosses, I’ve learned to use them aggressively on trash in Uldir. As to the hardest fight to heal, I’d say G’huun, because the room is so large. There are debuffs that have to be dropped on the edge of the room, there are the platforms on either side where orbs must be collected, and those annoying murder tentacles can spawn all over the place. You move around a lot, and I usually keep an eye on players doing orb runs on one side, which means I’m sometimes out of range of other group members. I feel like I spend as much time moving around as I do healing. Of course, every fight requires movement, but G’huun feels like you’re moving across a tremendously large space, with reasons you might be a good distance from your group. And that’s all for today, everyone. I’ll be back next week to see you again, but hopefully not to run LFR for your amusement again. Let’s just… not.